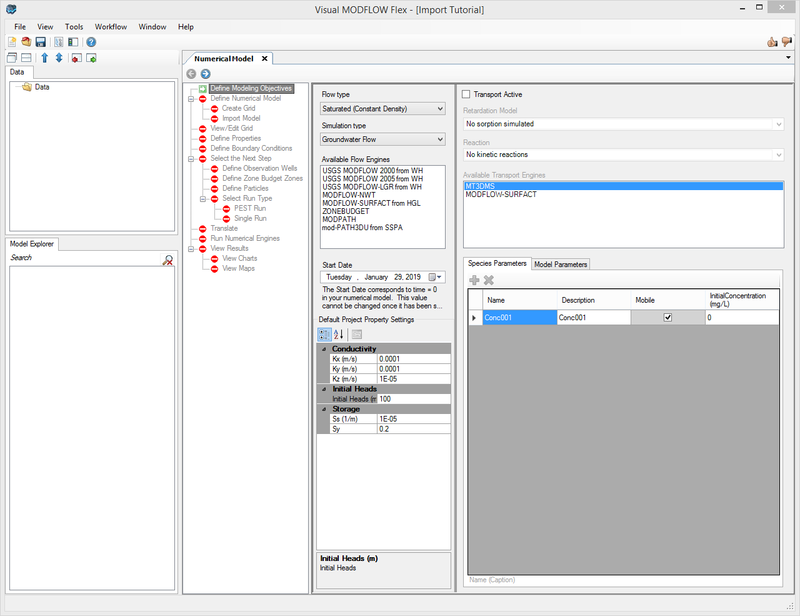 The first step in the workflow for developing and running numerical models in Visual MODFLOW Flex is to define the modeling objectives. This entails selecting the desired flow and transport simulation options. The selected combination of flow options (e.g. saturated groundwater flow) and transport options (e.g. reaction and sorption models) will narrow the list of available flow and transport engines and generate associated input variables (including units and default values). The purpose of this step is to develop the necessary inputs required to build the model based on your understanding of the relevant physical processes present within the study area. 1 - MODFLOW-SURFACT is a commercial groundwater modeling engine that supports coupled groundwater flow and transport simulations. 3 - MOD-PATH3DU is a particle-tracking algorithm developed by a collaboration between S.S. Papadopulos & Associates (SSPA) and the University of Waterloo. It is not installed directly with Visual MODFLOW Flex and must be downloaded and installed separately from the mod-PATH3DU website. Values set at the Define Modeling Objectives workflow step are used by Visual MODFLOW Flex to populate the applicable arrays for the flow and transport model consistent with the modeling objectives upon reaching the Define Properties Step for the first time. Constant values (discussed below) are the exception to this and are discussed below. Once the applicable arrays have been created in the Model Explorer, changes to the default values at the Define Modeling Objectives will not be reflected in the Flow and Transport Models. To reset values for a group of properties (e.g. Flow/Conductivity or Transport/Initial Concentrations) delete the relevant node from the Model Explorer Tree, update the default value at the Modeling Objectives step and proceed to the Define Property Zones step to regenerate the deleted arrays with the updated defaults. Under the left panel of Define Modeling Objectives, you can specify a Start Date for the project. Pumping well data and calibration data (head and concentration observation wells) are entered and save as absolute (calendar) dates. 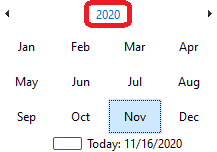 Therefore, it is important to choose a relevant start date at this step that coincides with the start time of your simulation. 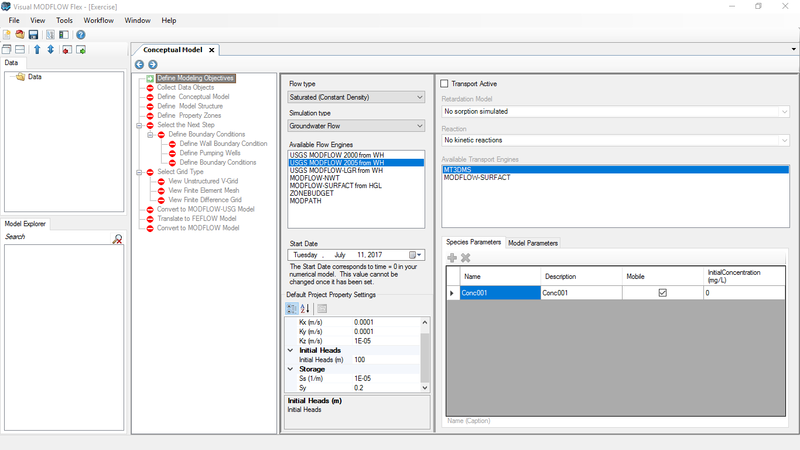 Under Property Settings, you can modify the default flow parameters. The start date will be used to retrieve pumping well and head/concentration observation data for the model run. 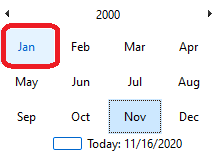 When you define well data with absolute (calendar) dates, it is important that your start date reflects the actual start time for the model run. The well data must fall on or after that start date. Otherwise, these data will not be included in the simulation. Also the start date cannot be changed once it has been set. If you inadvertently set the wrong start date, you can import your pumping well data and observation data in relative times (eg. starting at 0), and you will see no difference in the numerical model inputs/outputs. 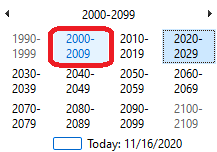 The model start date for this exercise should be set to 1/1/2000. 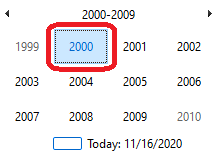 Visual MODFLOW Flex uses a standard Windows date picker; a few tips are shown below on how to use this. 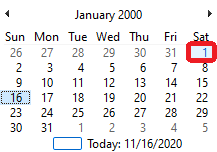 Click on the button shown below, to load the Windows date picker. A list of months will then appear for that year. Select January for this example, as shown below. 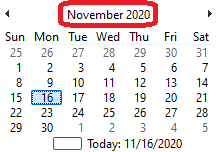 The selected date will then appear for the Start Date. The transport objectives are defined on the right panel of the Define Modeling Objectives window. When you select the "Transport Active" check box at the top of the screen, then the options can be defined as explained and shown below. Note: MODFLOW-SURFACT supports additional reactions listed in the table above; however, these are not fully supported in the current version of Visual MODFLOW Flex. The selections you make for Sorption and Reaction options will determine what parameters you need to define for your model. Default values can be defined in the "Species Parameters" and "Model Parameter" tabs. After the model is created, you can define additional zonation for Transport Properties at the "Define Properties" step. Detailed information regarding these parameters can be found in the MT3DMS, RT3D, SEAWAT, and SURFACT Users Manuals. 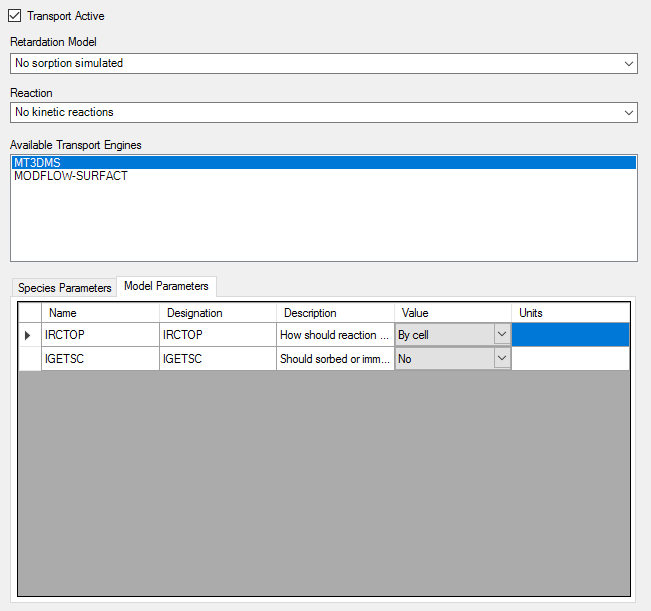 The New Species and Delete Species buttons allow you to add and remove species to your Transport simulation. This option is available only for certain transport engines. When you Species Parameter tab is selected, use the add button ( ) to add a new species, or use the remove button ( ) to remove the selected species. Please Note: the remove button will remove the last species in the list. The reaction model parameters window is shown below. For more information, see the individual sections describing Species Parameters and Model Parameters. When you are finished, click (Next Step) to proceed.